There’s no dress rehearsal for this crazy thing called life! 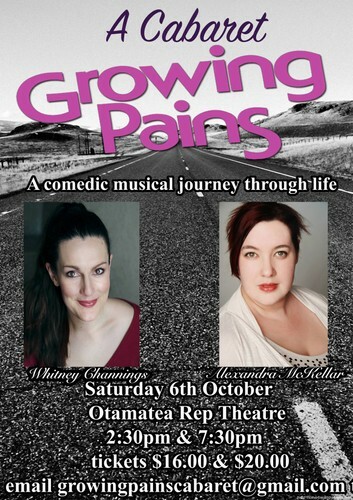 Local professional performers Alex McKellar and Whitney Channings have united to create Growing Pains- A Cabaret. Whitney grew up in Mangawhai and is a past member of Otamatea Repertory Theatre, and Alex is the new drama teacher at Otamatea High School. “Growing Pains is a comedic look at the ups and down of life. The choices we make and the effect they have on your overall journey” says McKellar, “Travel, motherhood, career, all of these are universal experiences and we take you through this journey through well loved musical numbers” says Channings. Growing Pains is on for two shows only, at the Otamatea Repertory Theatre, Saturday October 6th, 2.30 and 7.30pm. Join Whitney and Alex as they take you on a musical journey through the highs and lows of travel, romance, motherhood and growing up. A story that is sure to entertain, whether you’re young - or young at heart!